The Silmarillion asks a lot of you, but it pays its debt tenfold. More beauties and sorrows are woven into those 300-some pages than most fantasy series can manage to dredge up with dozens of door-stopping tomes. Although many have tried to compare it to other works (The Bible, Le Morte d’Arthur), Tolkien’s masterpiece is truly unlike any other book you will ever read. Because of that very uniqueness, however, many are baffled by it. Since I am quite the evangelist for The Silmarillion, over the years I have formulated quite a bit of advice for first-time readers. Here is some of it. Don’t think of it as a supplement to The Lord of the Rings. If you read The Silmarillion only in the hopes that it will answer all your questions about Tolkien’s more popular works, you will very quickly become frustrated. Don’t get me wrong – it will help you understand Lord of the Rings. Eventually. But it will take hundreds of pages before you see anything that seems to have any direct bearing on Frodo & Company. The heroes of The Silmarillion all have their own stories to tell, and you cheapen their valour if you view them only through the narrow lens of a later tale. Be patient; the full glory of the complete legendarium will unfold in its own time. You will probably also have to re-read The Lord of the Rings to pick up on all the connections. Imagine you are reading a nonfiction book about the French and Indian War, and the author says something like, “This tactic would later be used in the American Revolution.” Would you throw up your hands in disgust and say, “Well, that’s just great. I wanted to be surprised when the Americans rebelled.” Of course not. Because it is history, the author assumes you are already familiar with the basic outline of events. The Silmarillion is written with much the same set of assumptions. Try to think of it in the context of its in-universe explanation: this is a collection of stories that Bilbo translated from the songs and poetry he learned at Rivendell. Not only do the stories come from an Elvish perspective, but they also assume a general knowledge on the part of the reader. So you will see phrases like, “until the doom of Gondolin was come,” more than five chapters before the Fall of Gondolin. Don’t feel chained to the printed order of chapters. The story [of Beren and Luthien] is (I think a beautiful and powerful) heroic-fairy-romance, receivable in itself with only a very general knowledge of the background. But it is also a fundamental link in the cycle, deprived of its full significance out of its place therein. Read that again; it’s important. You need to read the entire Silmarillion to understand how the full mythic cycle is locked together in a vast woven fabric, but you don’t need to read each story in chronological order to understand them. The Silmarillion is not weighted evenly; all the best parts are loaded near the end of the book. The ‘Great Tales’ at the heart of the mythic cycle – Beren and Luthien, Turin Turambar, and the Fall of Gondolin – do not begin until around page 150 (pagination is usually pretty standard across editions). So if Aragorn’s brief summary on Weathertop roused your curiosity about the story of Beren and Luthien, go ahead and read it first. The back of the book provides an index of names, several genealogies, and a guide to Sindar roots. These are very helpful resources, but don’t get trapped there. It is not important to remember every single name and keep track of every single geographic feature, especially not on the first reading. Reference the glossary if you get really confused, but press on as much as possible. Talk to other people about it. Sometimes the most interesting thing about The Silmarillion is talking about what it means to different people (internet talking counts too). If you want to listen to the thoughts and analysis of some very clever and funny people, try the Silmarillion Seminar by the Tolkien Professor. Though it is very easy to get discouraged by The Silmarillion, seldom does anyone regret reading it through. The people who like it tend to really, really like it. I hope you will be one of them. 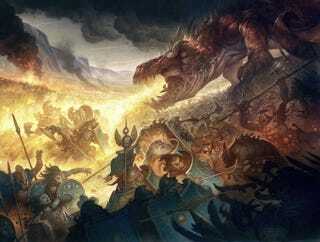 What does Tolkien mean by the word &apos;DOOM&apos;?